Jagriti Yatra is the largest train event of its kind in the world. It is a 15 days, 8000 kilometers national train journey which takes 450 carefully selected youth to meet with iconic role model entrepreneurs to meet with role model entrepreneurs who have created a remarkable social and economic impact. 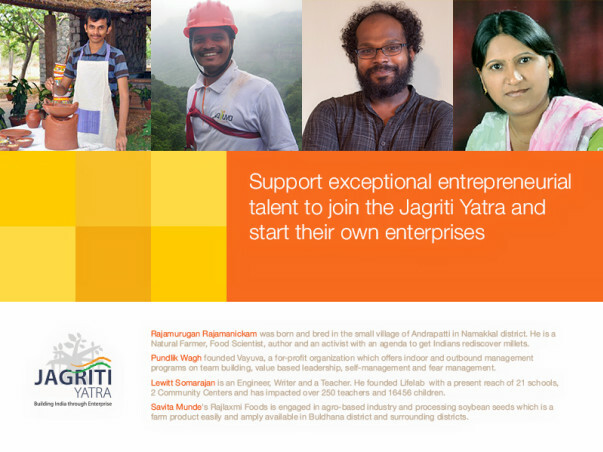 Jagriti Yatra receives more than 17000 registrations each year. Around 2500 Yatris have transformed through this unique experience. Our focus is on youth from Middle India (India of small towns and rural areas) and our aim is to inspire youth to be job creators rather than job seekers. In the past six years, over 300 new entrepreneurs have been created. Around 60% of the Yatris (participants) are from financially deserving backgrounds and Jagriti raises funds for these young people to enable their participation.